Monkey Bread is such a delicious treat for breakfast, tea, or any ‘ol time. Making Monkey Bread from Scratch is kind of a rarity today, though. If you look for recipes online you will find plenty that are made from pre-made raw dough which is full of food coloring (yes, a lot have that lovely petroleum food coloring), gmo corn and soy, and preservatives. 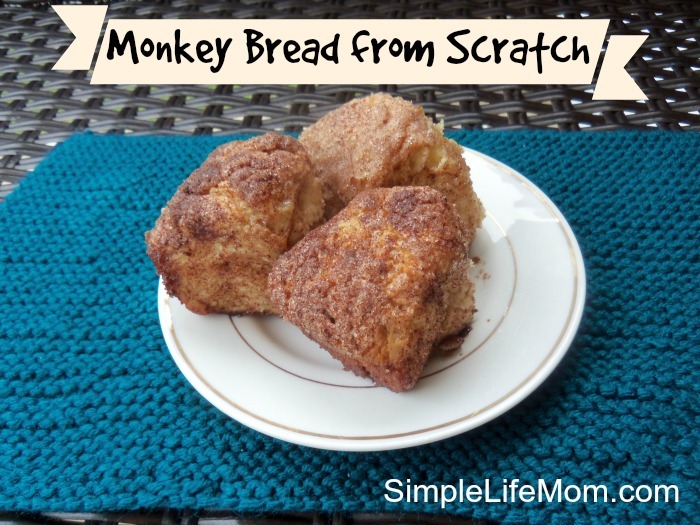 Making your own monkey bread from scratch only takes about 5 extra minutes, is healthier for you, and the kids love it! My kids were a lot younger the last time we made monkey bread so they don’t remember it. But they had a blast when we made it the other day. Not only do they get to help make the dough, but they get to tear off chunks, roll it in butter, cinnamon and sugar, pile it in a dish and see what happens. It’s definitely a kid friendly dish, because it pulls apart easily – no slicing etc. And this also makes it great for get togethers, potlucks, and when your kids have friends over. Combine yeast, warm water, sugar, oil, and whole wheat flour in a large bowl. Let set until it begins to bubble (5-10 minutes). Combine salt and flour and add to yeast mixture. Add enough flour so that you can handle the dough. Tear off chunks (about golf ball size) and roll them into a ball. Roll dough balls in butter, then in cinnamon and sugar mixture. Add to a greased shallow dish, or a bunt pan (really, anything works). ** You can leave the egg out. We have egg allergies and have done that and it has worked great. ** You can put it in the oven without letting it rise. They still turn out great. Not quite as airy, but still wonderful. 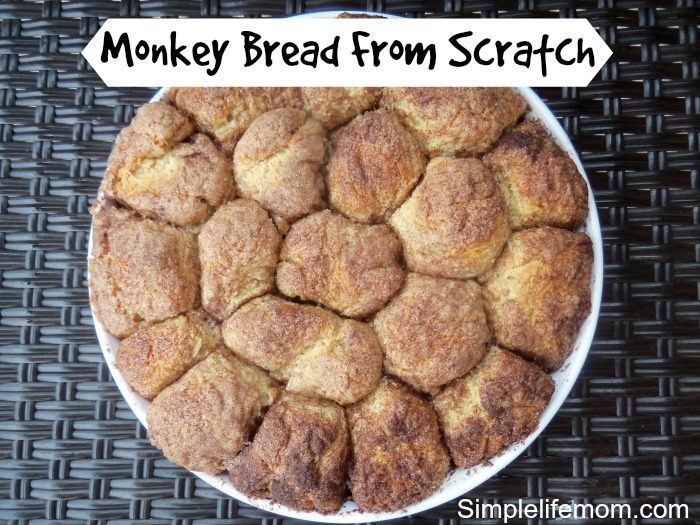 Your Monkey Bread looks fantastic, yum! Hope you are having a great week and thanks so much for sharing this awesome recipe with Full Plate Thursday. Mmmm, monkey bread is one of my favorite special breakfasts. I’ve never tried making it from scratch, though. I bet it will taste so much better that way! Thanks for sharing with Hump Day Happenings. Kelly, I can’t wait to try your recipe on Saturday. It sounds wonderful. I really like it because we cook/eat/grow only non-gmo, organic food and this recipe is a cinch to convert. Thanks so much for sharing it. Your site is so lovely, I like the clean look of it.